7 Things You Probably Didn't Know About Delta Air Lines, Inc. Interested in this industry-leading airline? The sky's the limit with how much you can learn, but here's a good place to start. Although Delta Air Lines (NYSE:DAL) is a familiar name in airports around the globe, there are plenty of investors who don't know everything about the airline. Since the best investors are well-informed investors, let's look at some things that help provide a more complete view of the company. Today, Delta is recognized as one of the world's largest airline carriers, but it comes from much more meager beginnings. Delta Air Lines can trace its history to 1924, when the Huff Daland Dusters crop-dusting organization -- the world's first commercial agricultural flying company -- was founded. In 1928, Huff Daland Dusters was sold and renamed Delta Air Service, after the Mississippi Delta region it served. Delta Air Lines is gaining plenty of recognition recently, ranking No. 31 on Fortune's list of The World's Most Admired Companies for 2016. It also appeared on another of Fortune's lists for 2016: 100 Best Companies to Work For, where it ranked No. 63. According to Fortune, this is the first time the airline has made the list and the first time in more than 10 years that any airline has made the list. Among other reasons for such high accolades, the company is committed to rewarding its employees. In fiscal 2016, Delta reported $8.85 billion in earnings before interest, taxes, depreciation, and amortization (EBITDA), and returned about $1.12 billion to employees through its profit-sharing program -- about 12.6%. United Continental (NASDAQ:UAL), on the other hand, returned $628 million to employees through its profit-sharing program -- about 9.5% of the $6.34 billion it reported in EBITDA for fiscal 2016. Demonstrating its commitment to providing a superior in-flight experience, Delta became the first U.S. airline to offer free in-flight entertainment to its passengers in the summer of 2016. The onboard entertainment suite, Delta Studio, offers passengers up to 300 movies, 750 TV shows, more than 2,000 songs, and 18 channels of live satellite TV on select aircraft. It didn't take long, however, for competitors to follow suit. Weeks after Delta announced the launch of Delta Studio, American Airlines Group (NASDAQ:AAL) issued a press release revealing its plan to "elevate the customer experience by adding complimentary premium movies, TV shows, music and games in the Main Cabin on domestic flights offering seatback entertainment systems or Wi-Fi streaming." In September 2005, Delta filed for reorganization under Chapter 11 of the U.S. Bankruptcy Code. Completing its restructuring plan one year ahead of schedule, Delta emerged from bankruptcy on April 30, 2007. 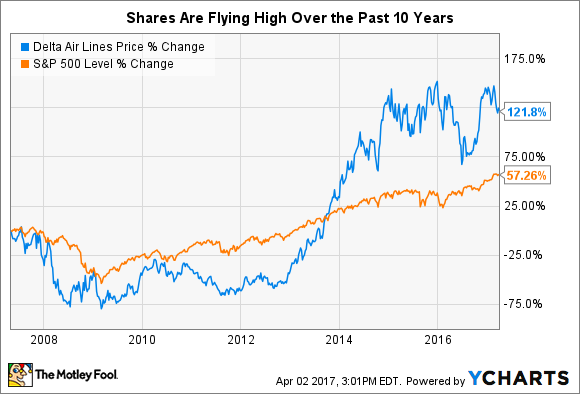 Since the stock was relisted on the New York Stock Exchange on May 3, 2007, it has handily outperformed the S&P 500, climbing more than 120%. Bankruptcy was far from the only adversity with which Delta Air Lines contended during 2007; the company fended off a hostile takeover bid by US Airways. Valued at nearly $10 billion, the offer from US Airways (which has subsequently merged with American Airlines) was rejected by Delta Air Lines' creditors. Between replacing older aircraft, maintaining upkeep of aircraft in service, and keeping its facilities in good shape (among plenty of other requirements) running a successful airline doesn't come cheap. In 2016, for example, Delta Air Lines reported that it had invested over $3 billion in improved products, including 38 new aircraft and new terminals in New York, Los Angeles, and Salt Lake City. Consequently, maintaining a healthy balance sheet is imperative for any airline. Having emerged from bankruptcy, Delta has proved that it's adept at managing its debt. In the company's 10-K for fiscal 2016, management reported that the company "received upgrades to [its] credit ratings by all three major rating agencies, including investment grade ratings from Moody's and Fitch." DAL Financial Debt To EBITDA (Annual) data by YCharts. 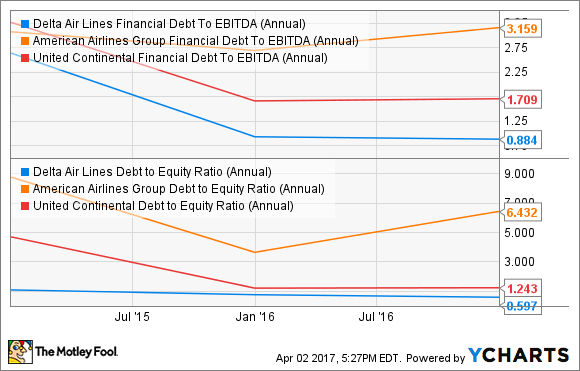 A quick peek at its peers' performance provides another perspective on Delta's impressive management of debt. The company maintains a total debt-to-EBITDA ratio under 1.0 and a debt-to-equity ratio under 0.6. Both metrics suggest the company is in a far more secure position than American Airlines and United Continental. Besides being committed to returning cash to employees through its profit-sharing program, Delta is also committed to returning cash to investors. Between its dividend and share-buyback program, Delta maintains a target of returning at least 70% of free cash flow to shareholders. In fact, the company allocated more than $3 billion to dividends and stock repurchases in fiscal 2016, exceeding its target of a 70% return of free cash flow to shareholders. Delta's dividend currently represents a 1.62% yield, while American Airlines' stock offers a 0.95% yield. United Continental, meanwhile, doesn't currently pay a dividend.